Germany? Celtic culture? Scandinavia? Ask anybody where the Christmas tradition of decorating a tree with colorful balls, fairy lights, painted eggs, and small figures comes from and they probably won’t know the exact answer. The Celtic tradition speaks of Idrasil, the Tree of the Universe, which was supposed to link heaven and hell. The tree used to be decorated in order to honor Frey, the sun god, whose birth coincides with the Christmas season. On the other hand, some believe that Saint Boniface decided to turn the tradition into a Christian custom by cutting an oak with the Odin-symbolizing axe and planting a fir tree instead while he was evangelizing Celts in Germany. Since then, they say, the tradition continues. Did you know that the first monarch to have a Christmas tree in his palace was George III in 1762? It seems logical since his wife, the queen Charlotte, belonged to the Hannover family in Germany. And 250 years later, where are the most amazing Christmas trees in the world? Can you imagine who may own this Christmas tree? It looks like thousands of other Christmas trees around the world, right? The portrait on the wall is more than a hint, though. 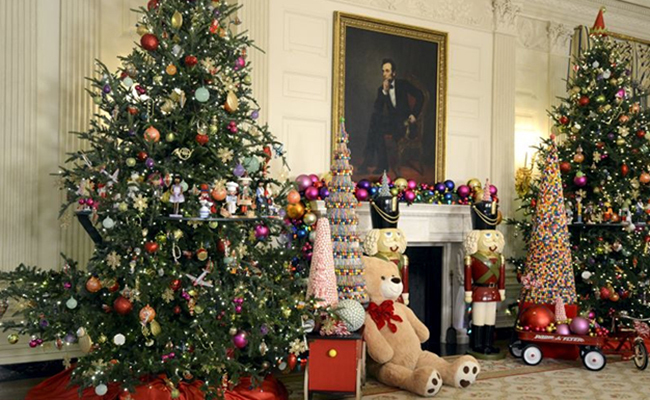 This is Barack Obama’s Christmas tree, which is very classic and traditional. However, if there is one Christmas tree in the world that has managed to gather and concentrate the holiday spirit is the one at Rockefeller Center. 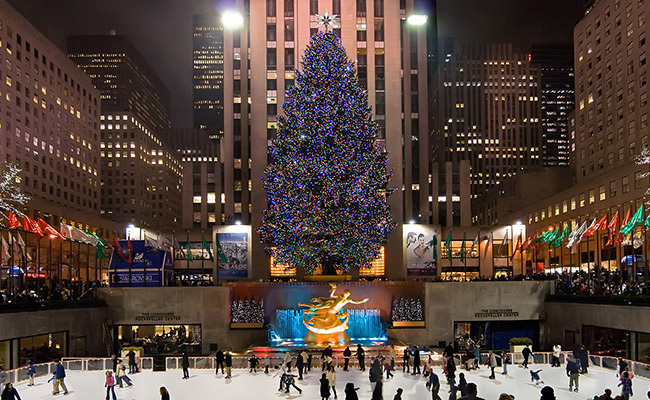 A tradition, including the ice rink that has become the unmissable Christmas experience in New York. It is also pretty classic, but its details leave no one indifferent. The 2015 one is a more than 23 meters high red fir tree, which is green in spite of the name, and it has been brought from the town of Gardiner in the State of New York. So far so normal, but if they have already arrested five people trying to climb and reach the star at the top it makes you think that it must have something special. It contains 25,000 Swarovski crystals! In Legoland they set one of the most original Christmas trees in the world. In some Lego-themed parks, but more specifically in San Diego, California, they use more than 300,000 of its world-renowned plastic blocks to build an almost 10-meter high Christmas tree. It is not one of the highest in the world, but your could imagine that it takes a while to install! An engineer has to carefully calculate the weight and distribution of each of the blocks so that no loosening or breaking off happens. If sometimes it’s hard to design a construction with the Lego blocks, imagine building something of these dimensions! Moreover, all the objects that adorn the tree, including the 6,5-kg angel on the top, have also been assembled one by one. In total, 4,550 blocks make up the Christmas tree. How quickly could you finish this puzzle? It only took them 50 hours. 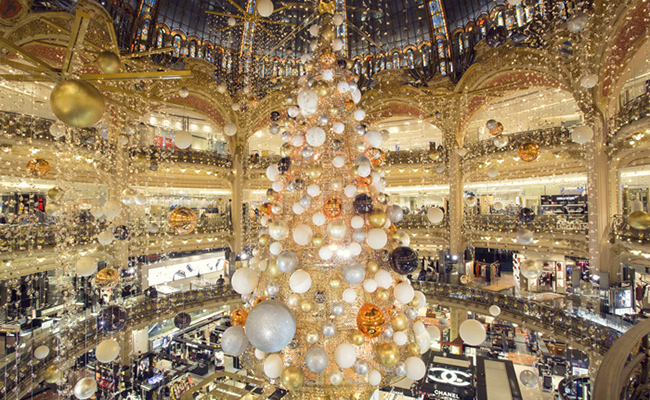 Galeries Lafayette get better each year at combining elegant classicism and original innovation with great success. In previous years, they have surprised the world with an inverted Christmas tree that seemed to hang directly from the spectacular Art Deco dome or a mechanical one that seemed to move with the precision of a Swiss watch -in fact , the mechanism was built by Swatch! This year, however, they present a Christmas experience from another planet. Thus, under a real cosmic cloud , this year’s Christmas tree is decorated with hundreds of spherical gold and silver meteorites, with shooting stars and all. It doesn’t seem to be a random fact that it coincides with the world premiere of Star Wars Episode VII. If you don’t believe it, take a look at their window displays, where everything seems to revolve around the universe of George Lucas. 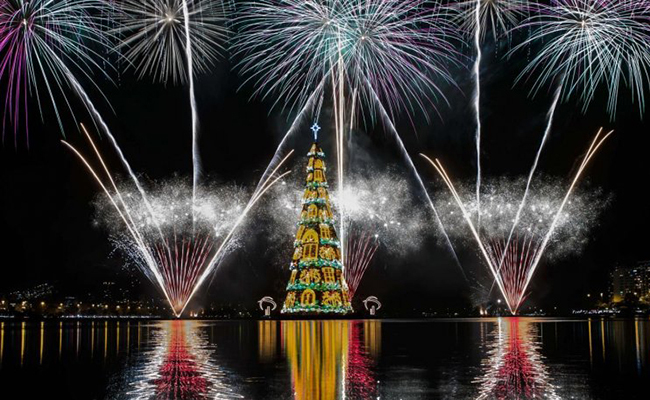 However, in order to see the most spectacular Christmas tree in the world you might need to travel to Rio de Janeiro. This floating Christmas tree is simply stunning! You will enjoy the best views from the shore of Rodrigo de Freitas Lagoon. In fact, this year’s Christmas tree held a Guinness record until it had to be restructured due to an accident during assembly. No matter how you look at it, this architectural wonder is just impressive. It is 53 meters high, it weighs 350 tons, it has 2,500,000 lights bulbs that make it visible from any point of the city and a 810 square meter base, as well as eleven gigantic metal floats that are2.44 meters high and weigh 16 tons. No wonder this tree is the symbol of what they call “the Christmas of Renewal.” The city will host the 2016 Olympic Games and they want to start the year in style, of course! Nevertheless, according to the different traditions, Christmas trees are originally from Europe and that’s why the Old Continent has some of the best examples. To prove that, you just need to go for a walk around the Puerta del Sol in Madrid, where you will be able to admire a Christmas tree as tall as a 12-storey building, even though it may not look like it. Visit the Old Town Square in Prague with his famous market or the streets of Nantes to find one of the most original Christmas trees in Europe: although it is only 10 meters tall, they needed 4 tons of chocolate to build it! The Grand Place in Brussels offers a hypnotist light show on its Christmas tree and surrounding buildings, and we shouldn’t forget the Piazza Castello in Turin or the Red Square in Moscow, among many other places. And you, did you get some nice ideas to decorate your Christmas tree this year? Ask anybody where the Christmas tree tradition comes from and they probably won't know the exact answer... but everyone loves it! !